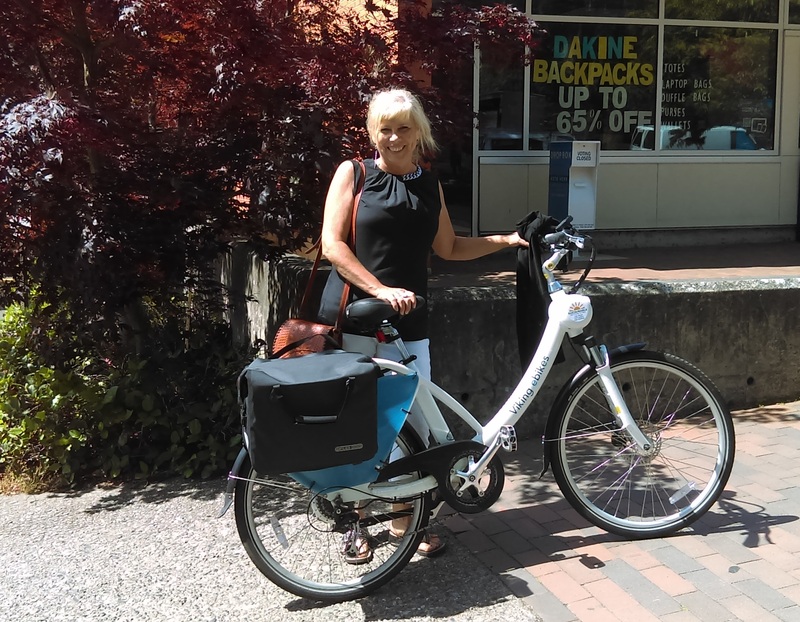 Wendy Johnson is participating in the Viking eBike project this summer. She works in the Viking Union Reservations Office. Wendy has this to share about her experiences riding an e-Bike. It’s been a pleasure to take part in the Viking E-Bike Project. I’m by no means an avid bicyclist. I’m really a fair weather cyclist who likes to ride my bike in the summer to head downtown for a meal and a movie, or to the neighborhood store, or our yearly Fairhaven Ski to Sea Festivities. But having the privilege of being the care-taker of the Office of Sustainability’s Electric Bike for the summer has encouraged me to ride to work 3 times a week, to the gym, downtown, to visit friends, and many other trips that I would usually depend on my car. Living in the Birchwood neighborhood, and being the kind of person who head’s out the door at the last minute to come to work, I just would not have seriously considered riding my bike to work. The hills were particularly daunting for me and getting to work on time would have been a real problem. I like to ride downtown because I can easily circumvent the hills. But with the E-Bike I am able to take shorter routes and pedal right up Chestnut St! It’s been so fun. I absolutely LOVE this bike and would really like to own one. The bike is definitely heavy, which makes it difficult to ride with no electricity. While I have attempted to ride it without the electricity, it’s a bit of a drudge. Besides the weight factor, the bike has been a real asset to my life. In the three weeks I have had it I have taken literally dozens of fewer trips in my car. I’m looking forward to the rest of the summer and really committing to riding more and driving less.